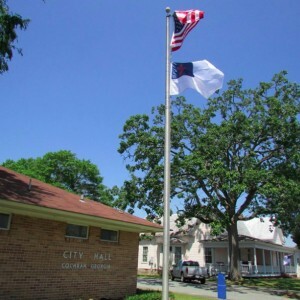 COCHRAN, Ga. — The city council of a municipality in Georgia has decided to reverse its course regarding a Christian flag that it initially approved to fly outside of city hall, and has voted to remove the flag at the end of the week. The city council in Cochran had voted 5-1 last month to allow the flag to stay—a white and blue flag with a red cross first created in 1897 to honor the Christian faith. The flag was meant to coincide with a Bible reading marathon from May 1-7 sponsored by the International Bible Reading Association, a private organization. But the flag was taken down for a time by the city manager after the city attorney asserted that it could pose a legal issue. “The city manager took the flag down because an attorney said we could have a problem,” Councilman Gary Ates told local radio station WMAZ. However, between 75-100 area residents urged officials to restore the flag to its place. “The people of Cochran came to a city council meeting and said, ‘Let’s put the flag back up’,” Ates explained. Therefore, the flag was again flown outside of city hall. But group Americans United for Separation of Church and State claimed that it had received several complaints and sent a letter to the city to assert that the flag is unconstitutional. The organization is led by Barry Lynn, who is stated to be a licensed United Church of Christ minister. While it is not known how much influence the group had in the city’s decision, officials further analyzed its decision to restore the flag and decided to remove it after all. It voted 4-1 on April 28 to take the flag down—at the conclusion of the Bible reading marathon. “After reviewing further imput from the community, detailed written legal opinions from our city attorney and a second legal opinion from a constitutional lawyer, impact on the city fiscal resources and the environment in which the original decision to exclusively fly the Christian flag was made, the city council voted … to rescind the motion to exclusively fly the Christian flag 24/7 from the flagpole at city hall and remove the flag effective May 8th,” a statement posted on the city website reads. “The only flags that wil be flown from the flagpole at city hall will be the U.S. and state flags,” it continues. The Georgia state Constitution, first formally written in 1777—just one year after the founding of America—acknowledged Christianity and required its leaders to be Christians.